The OSCE Special Monitoring Mission to Ukraine (SMM) was deployed on 21 March 2014, following a request to the OSCE by Ukraine’s government and a consensus decision by all 57 OSCE participating States. The SMM is an unarmed, civilian mission, present on the ground 24/7 in all regions of Ukraine. Its main tasks are to observe and report in an impartial and objective way on the situation in Ukraine; and to facilitate dialogue among all parties to the crisis. Olga has reached the age of retirement but continues to work. “Staying at home would be silly,” she tells OSCE SMM monitoring officers, not least because she worries that her patients would be unable to afford to travel to the neighbouring hospital in Kurakhove. Maria and her fellow OSCE SMM patrol members – three other monitoring officers, plus an interpreter and a medic – started the morning with an operations briefing in the SMM Donetsk hub. Op-ed by Chief Monitor of the OSCE SMM to Ukraine for the Kyiv Post. Meet Gail, who works for the OSCE Special Monitoring Mission to Ukraine, and see if you’d like to be part of her team. 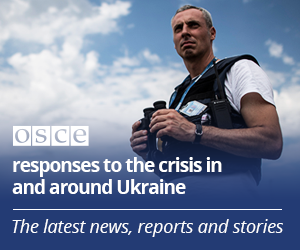 Learn about the important work being done by the OSCE's monitors in Ukraine. Monitors of the OSCE Special Monitoring Mission to Ukraine (SMM), and Principal Deputy Chief Monitor Alexander Hug patrolled in eastern Ukraine May 25-28. The OSCE Special Monitoring Mission to Ukraine (SMM) received two accommodation modules provided by Switzerland.